The festival of Holi brings happiness, enthusiasm and rapture on one hand and the problem of taking off colors on the other. 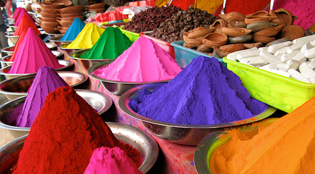 In the morning when we start playing Holi, we don’t think, that the color applied on our skin will even go off or not. While playing Holi if only general precautions are taken, then these kind of problems can be avoided. If before playing Holi you take these measures then body can be safe from getting these colors. And, Holi can be enjoyed unperturbed. If a day before Holi, mustard oil is applied on body, especially on face,hands and legs then the color can be removed from the skin easily. Additionally this oil should also be applied on hairs. By this, you can protect your hairs from damage caused by colors. Hair containing oil, store less color comparatively. If anyone doesn't like applying oil, then instead a lotion can also be used. After this, you can apply as much color you want, since, no strong color will be able to stay on your skin. Holi should never be played with chemical colors. For this, you can before hand tel your friend that colors containing chemical are not safe for skin. To protect your skin from the adverse effect of colors, you can apply sunscreen lotion on your body. This can possibly decrease the chemical effect of color. While playing Holi you should apply this near your eyes and even on your eye lashes. This can protect your eyes from the harmful effect of colors. If while playing holi, some dry color gets into your eyes then rinse it with clean water. On the day of Holi washing your eyes, time and again with water is adviseble. But, do remember not to rub your eyes, this may cause irritation in your eyes. On Holi, if a color is applied by rubbing, then use face wash instead of soap to remove it. But, do remember to remove the color gently from the skin. Rubbing and then washing can harm your skin. After playing Holi when you go for bathing, soak Multani Mithi about an hour ago. While taking bath apply this on skin where color is there. Dry this pack for sometime. then after drying,wash it. This Mud pack is very helpful in removing color from the body. If your body has got some very strong color, which is not getting removed after trying all means and methods then, take a peace of cloth and dip it into the kerosene oil and rub it with light hand. This way the color on body will vanish off. Mix gram flour, sweet oil and milk cream in rose water. Make a thick paste of it and apply it on face, hand and legs. Let it the paste dry. Then remove it by rubbing with hands. This way the color on skin can be removed. Add half bowl of curd in two spoon of lime juice, and apply it on the areas having color. Then take a bath with normal or a little warm water. This way the color surely goes off. Don’t forget to apply cream after taking bath. If you apply cold cream, Vaseline, olive oil or coconut oil on body , half an hour before playing Holi then the hold of color on skin becomes weak. Together with body, nails should also be taken care of. To keep the nails safe from the effect of colors, you should apply nail polish on them. And, cut the long nails. To keep your skin safe from colors, try wearing clothes which cover whole of your body. This way, less part of body will come in contact of colors. On the Day of Holi, mostly water is used. So, avoid wearing white or light-colored clothes. As, these clothes let to absorb more amount of color. Especially, ladies should avoid wearing transparent clothes, so, they will not feel ashamed on getting wet in water. Do not wear jewellery on the day of Holi. The force and emphasis while playing Holi can make you lose them. Ubtan can be used to remove color of Holi from body. How I wish someone told me this when I was young.